Now that Disney’s Oz The Great And Powerful has been released on Blu-ray Combo Pack, it’s time to celebrate with some Oz-some activities and a giveaway for a super fun Oz The Great and Powerful prize pack, perfect for a girl’s night in! Oz The Great And Powerful is now available on Blu-ray Combo Pack! of course you can buy it at Disney.com, but why not try to win a copy if you haven’t already purchased it? You’ll get all of these awesome bonus features! 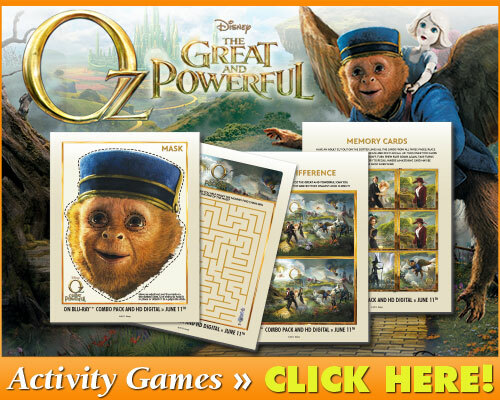 These Oz-some activities are the perfect accompaniment to this super fun prize pack, make sure to download them too! Retweet this blog post using the #DisneyOz hashtag! This giveaway ends on July 31 at midnight and is open to US residents only. I follow @DisneyOzMovie (@dobbss1910) I follow on Pinterest. I follow @DisneyOzMovie on Twitter and Pinterest as (moomama). I completed all three task to win this neat prize pack. I follow on twitter as @Allie0289. I follow on Pinterest as Allie0289. If you see this ~ I notice that some ppl are doing a separate comment for each item for a total of 3 entries. Is that correct? Also, is this a daily tweet? i follow on pinterest as kelly mcgrew. I follow DisneyOzMovie on twitter. I follow Oz The Great and Powerful on Pinterest.